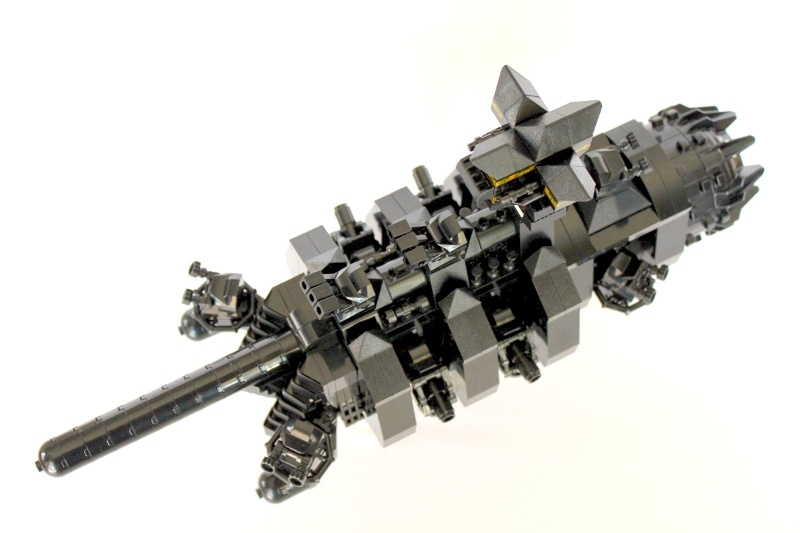 The Moto Moto is the latest battlecruiser from the Space Homeys Interstellar Technologies™. 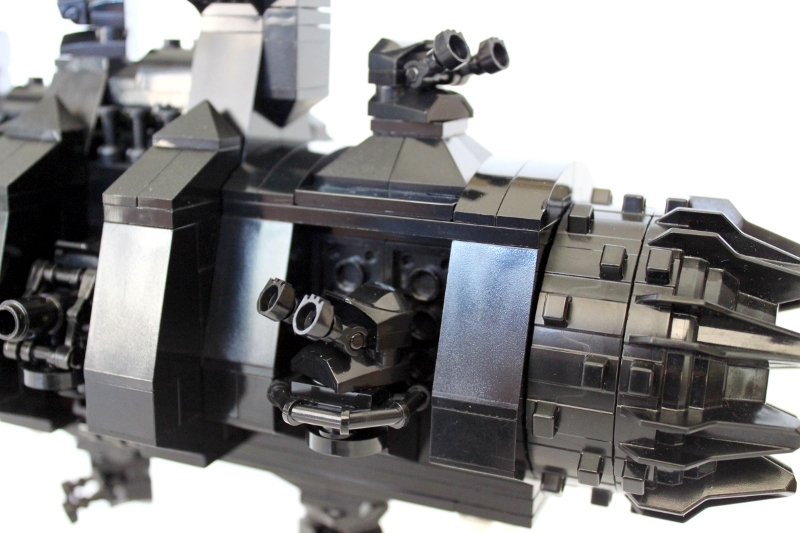 Never before has a compact space ship spread fear among enemies. Officially named BC – Saligia in the battle fleet, the Moto Moto achieves its deadly firepower and exemplary speed with its compact design. 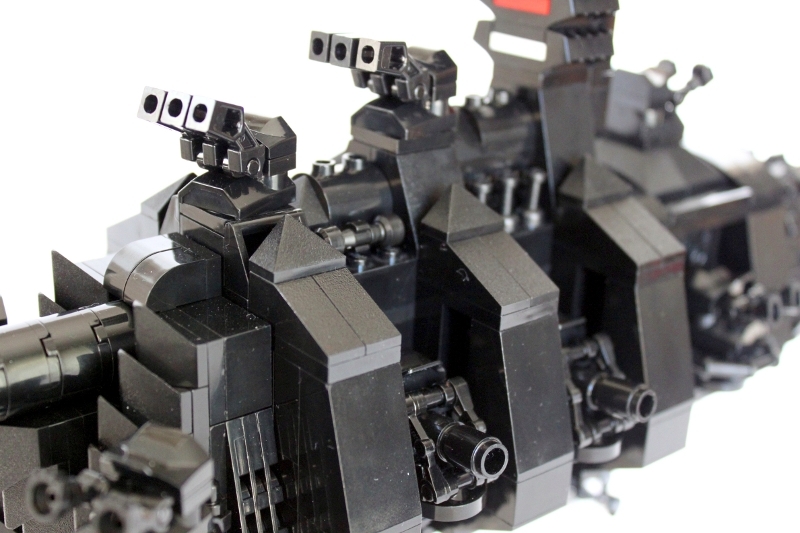 While the BC class designation stands for Battle Cruiser, it also means Big and Chunky when it comes to this dark force. It packs a punch to say the least. The Integrated Quantum Singularity Drive and Impulse Engine eliminates the need for multiple engines for different types of space travel. The unique bridge design allows for a virtually 360-degree view of the battlefield theatre. This ship was built for the Death Guard. The red and white stripes indicate their fleet designation. The Moto Moto is packed with several types of firepower. Triple Beam Point Defense Particle Beam Cannons are strategically spread out all over the ship for defensive purposes. The Shadow Quantum Gravitic Discharge Cannons create beams of coherent gravity waves that tear apart ships at subatomic level. 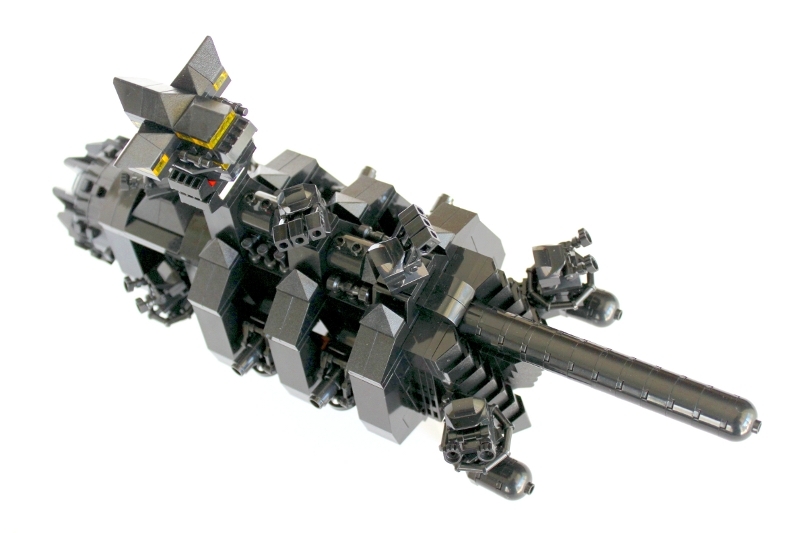 The main cannon of the Moto Moto is the Boltzmann-Einstein Electromagnetic Field Injection Slicer Cannon, affectionately called the B.E.E.F. Injector among the crew. 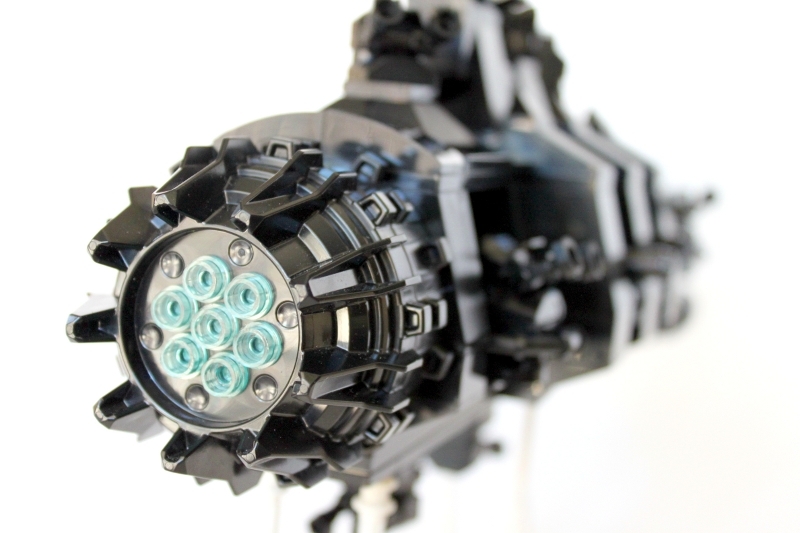 It can decimate ships in one, deep penetrating hit. 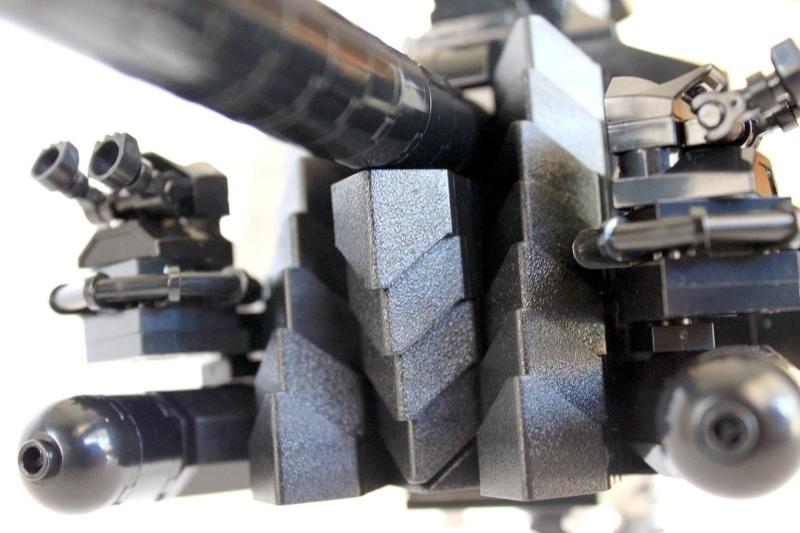 It uses controlled gravimetric waves to create an energy beam that shreds the target. Its reciprocating motion amplifies the waves' transmission energy. Chaff Throwers launch clouds of chaff around the ship. The chaff are canisters of thousands of small pieces of highly reflective aluminum. The chaff will remain around the ship for a period of time unless the ship accelerates, decelerates, or changes course which will take the ship out of the chaff cloud. 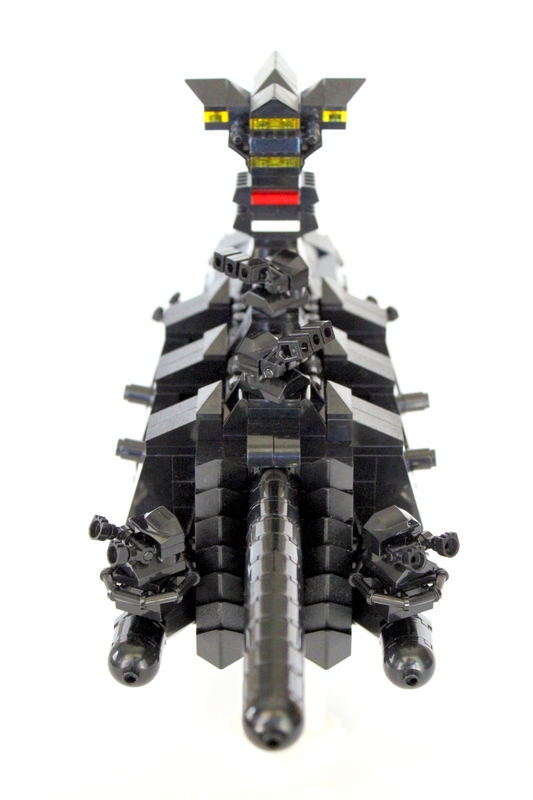 This ship was inspired by Battlefleet Gothic, Black Sun Class Battlecruiser, and Moto Moto from the movie Madagascar. 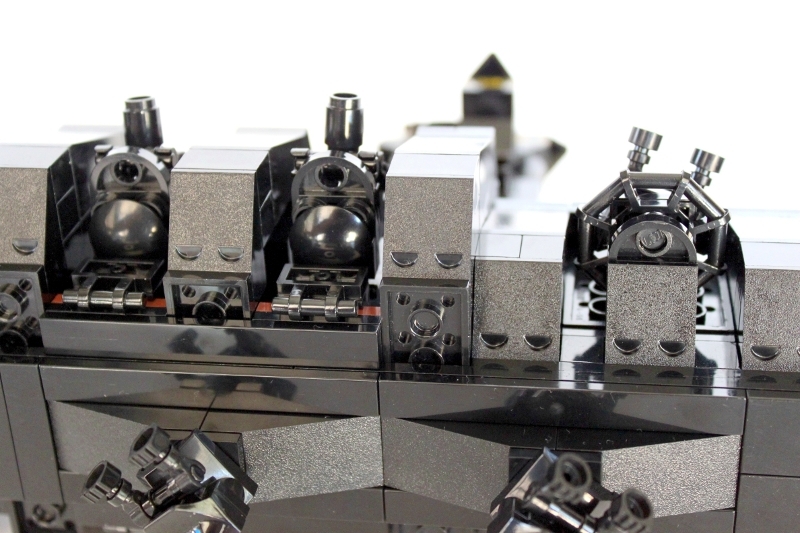 I like the amount of detail in this MOC and the lance at the front. You can imagine it jousting with other ships, like at knight in armour. crazy shooting power for such a little cruiser! also a cool mini here you done! This has to be the benchmark for micro space, really it's that good. The techniques and design are amazing. I like the engine compartment most. And you write nice descriptions too. Madagascar Escape 2 Africa is my favorite movie. Your main dingus is very impressive, my friend! 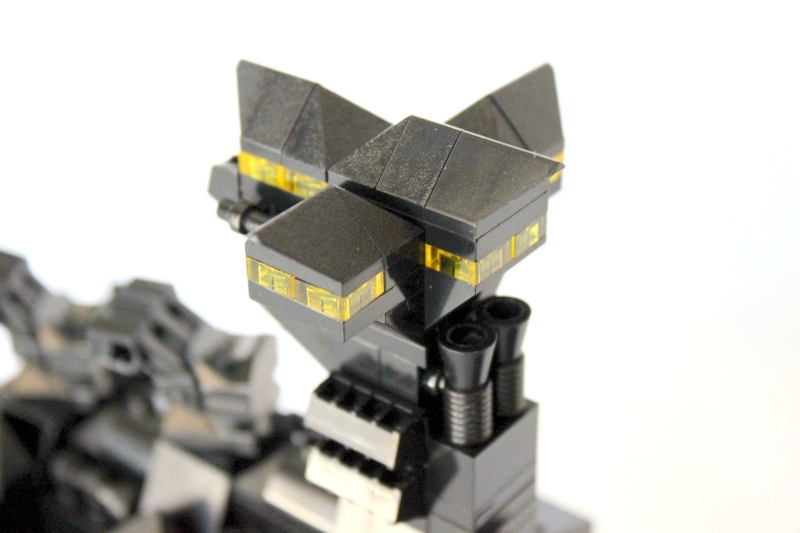 Wow,great job man,you're certainly a master with microscale builds! 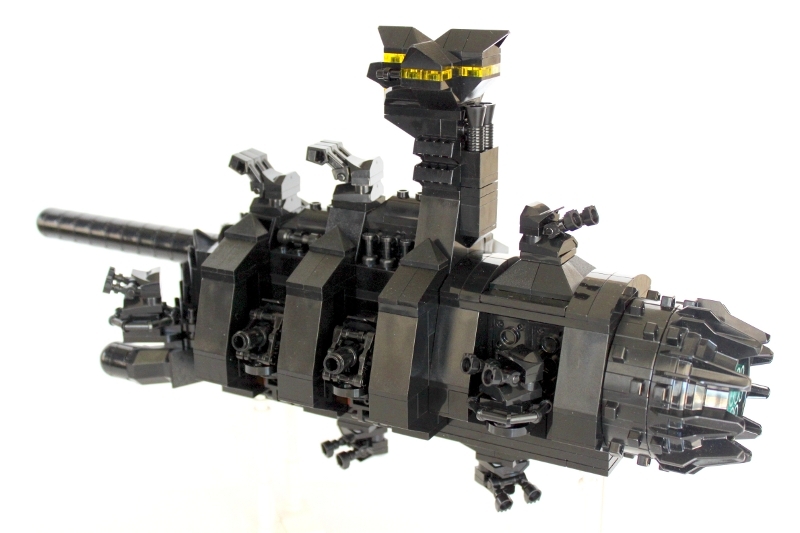 Quoting Alex Fojtik All the weapons systems are nicely built, but the robo arms for the topside guns are fantastic! 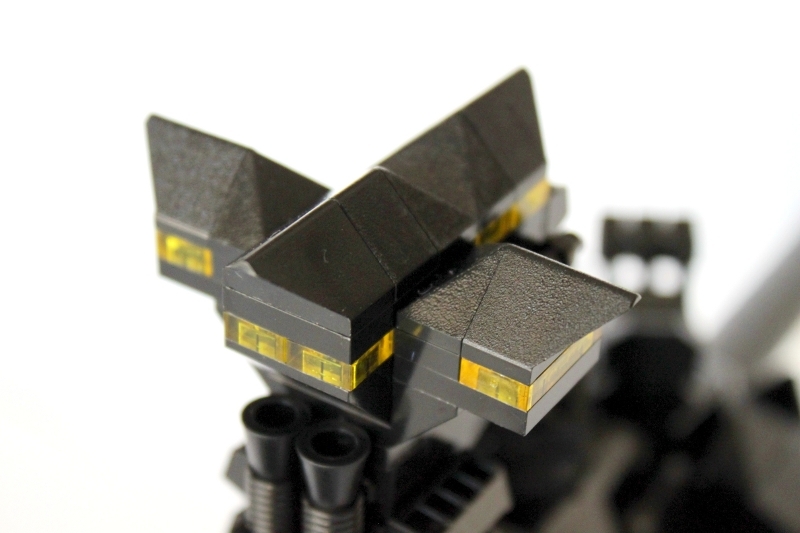 You seem to have great success photographing black lego. What kind of (and how many) light do you use? Two things on this photography: natural light + photo editing software from and old Canon scanner. It has an "auto enhance" feature that gives wonderful results in terms of black/white color balance but greatly degrades the picture. It helps to have a 15.1 megapixel camera. Thanks for the comment! 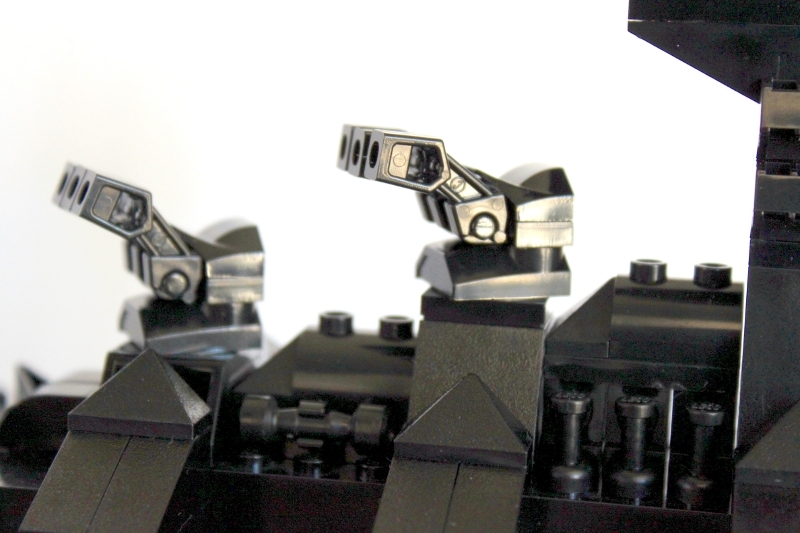 All the weapons systems are nicely built, but the robo arms for the topside guns are fantastic! 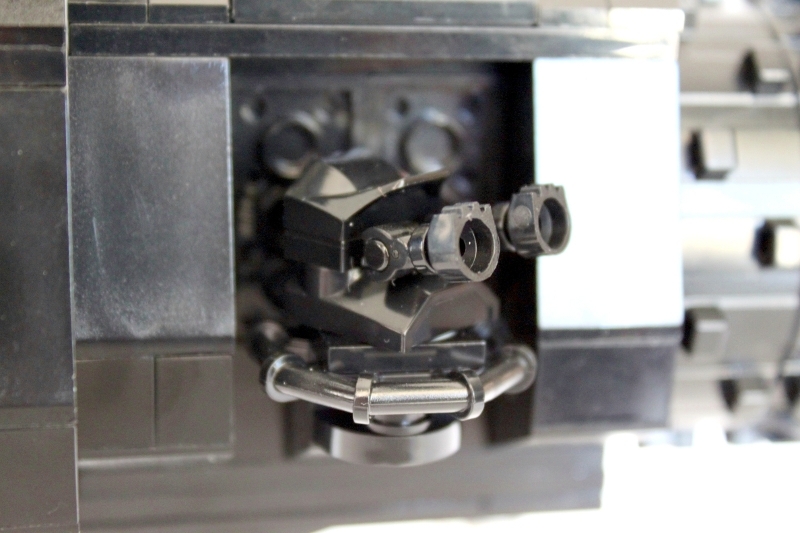 You seem to have great success photographing black lego. What kind of (and how many) light do you use? What a great little ship! 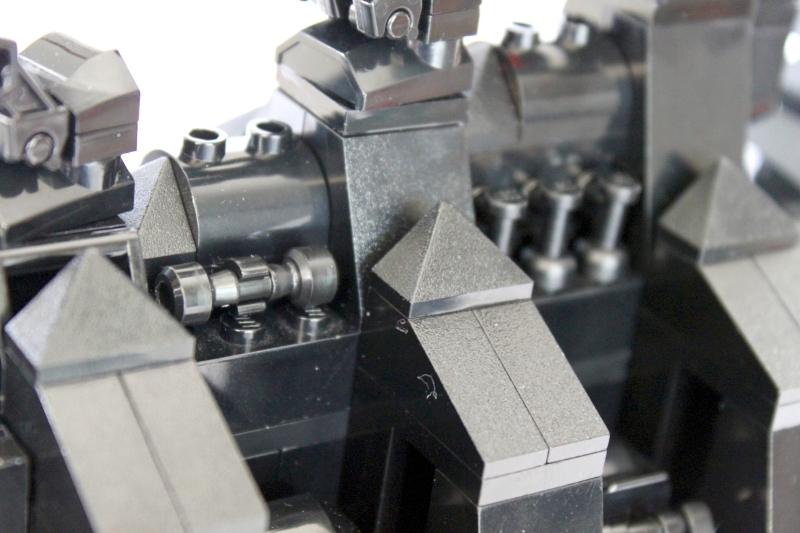 Tons of excellent details and all on such a small scale. Well-endowed, too! I don's know how I missed this! This one ba killing machine. 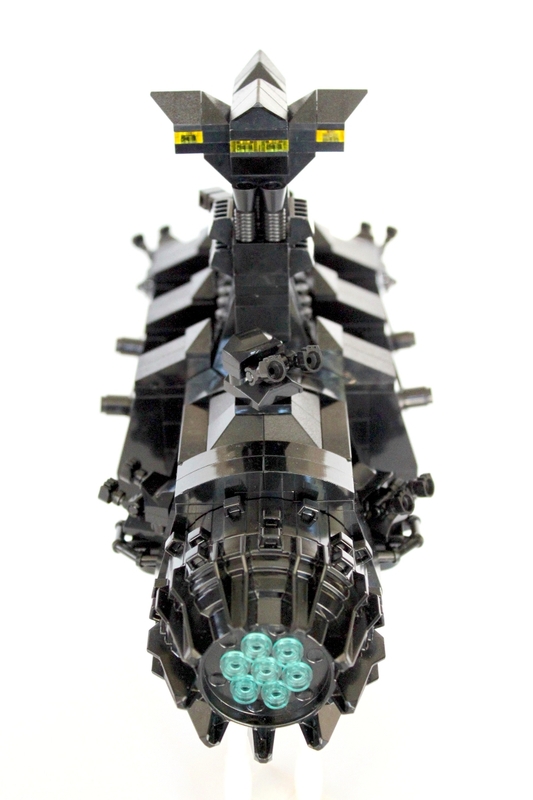 All the greebles are great and the whole thing is just wicked. Great job!!! Oh, how could I miss this?! It is awesome. 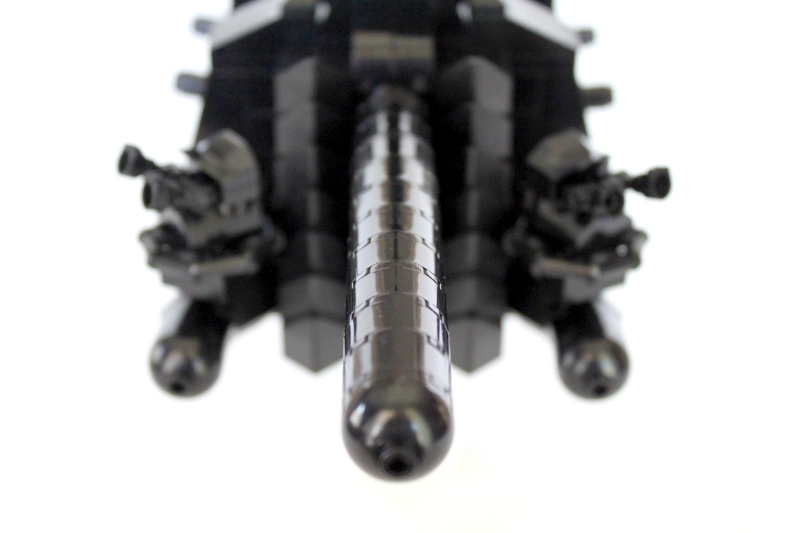 Love the detailes on the guns and your skills, when it comes to shooting black MOCs! But, are you sure that the long pole at the front doesn´t belong to Phipson? Sorry, I HAD to write this. HAHAHA! You seem to have a love of big long black things! All the details are sweet here. 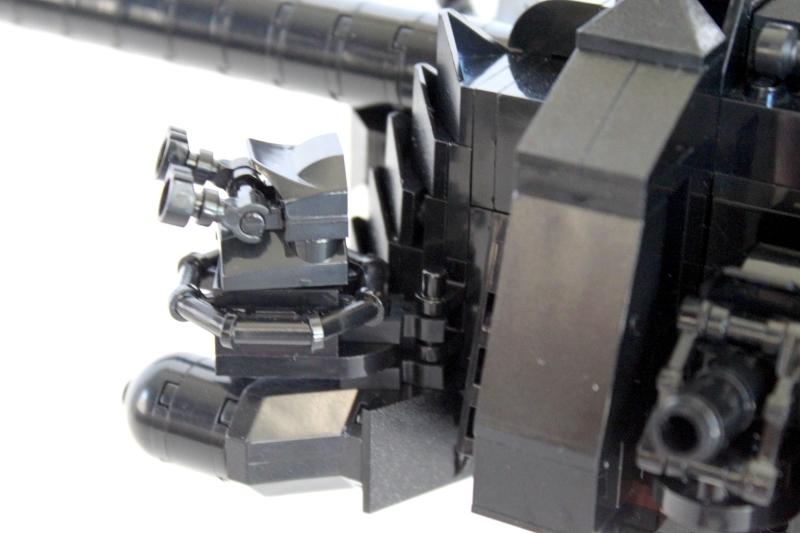 I especially love the engines/thrusters. It's packed with small details, I love that. The style of the bridge is quite interesting and The BEEF-canon is ...well, lets say outstanding. 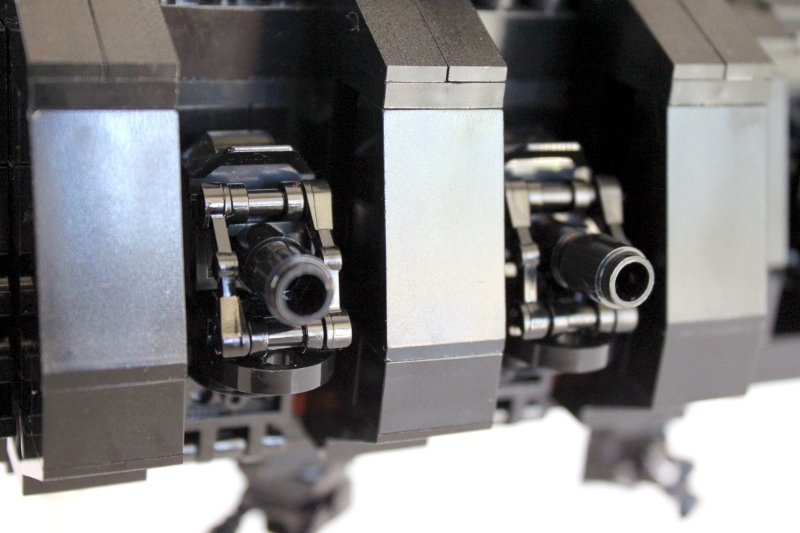 Especially loving all the micro-cannons (usually my favorite parts of micro builds), but most notably, the ones using skeleton legs! I find the BEEF injector vaguely threatening..... 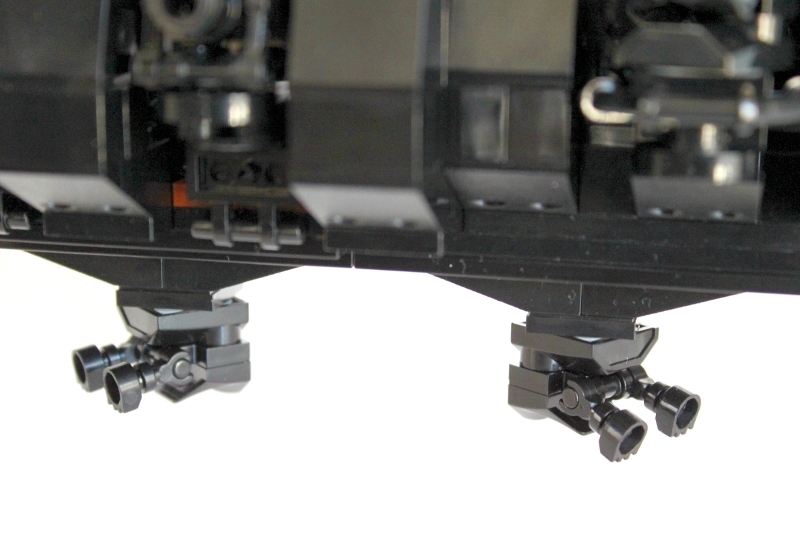 I do love the variety of turrets especially, and as Chris points out the skellie legs as cannons work very nicely. Good job mate! 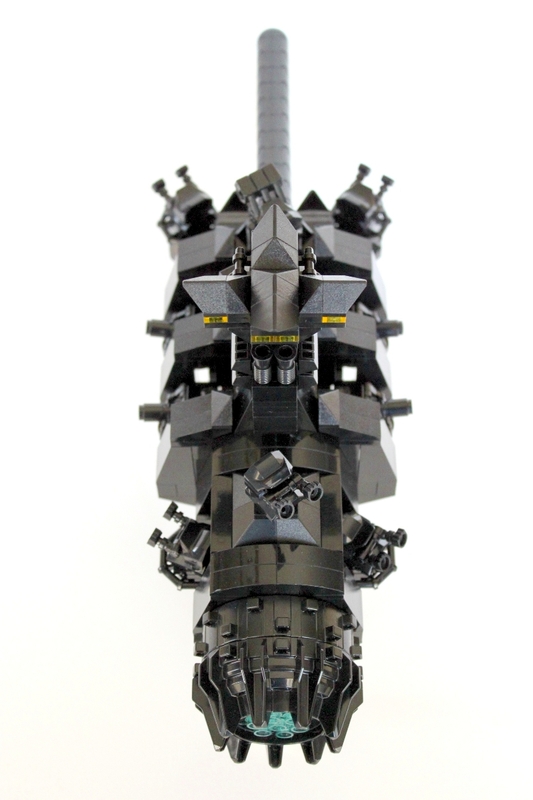 Looks really cool must have taken you long to build. Gorgeous black ship again Shifu. Lovely sleek build with lots of fun little details. Love all those cannons jumping out everywhere. That beef injector is very long. Sorry I'm running (WAY) behind on my comments. Great ship here Shifu! Even though it's "chunky" it really has a sleek look to it... does that make sense? Love the skellie feet as guns there too! ~ Chris. the front design is a bit odd to me, but, the rest of the ship is very nice, the sides especially, i love those big shapes that sculpt the sides, and hide the cannons, the armament is very impressive, and i suppose that it s why the engineers [you] did an obvious bridge, as an act of defiance towards enemies, it s an act of boldness, and it s tacticly sound! as the punishers chest skull, it s like a target! but, no one ever get the chance to even just fire at it! i like it, it s just too bad for the front, but, it s original, and black! good work shifu! See, I knew that envy would have to do with dudes in drag!!! I have an instinct for these types of things. LMAO Great looking ship man, my favorite part besides the bridge is the ion cannons. Somehow I doubt that a company who could make a ship like this is hardly what their initials spell out... DON'T try and make me say it!! I'm really impressed by the level of details here, and also the great quality of pics ! 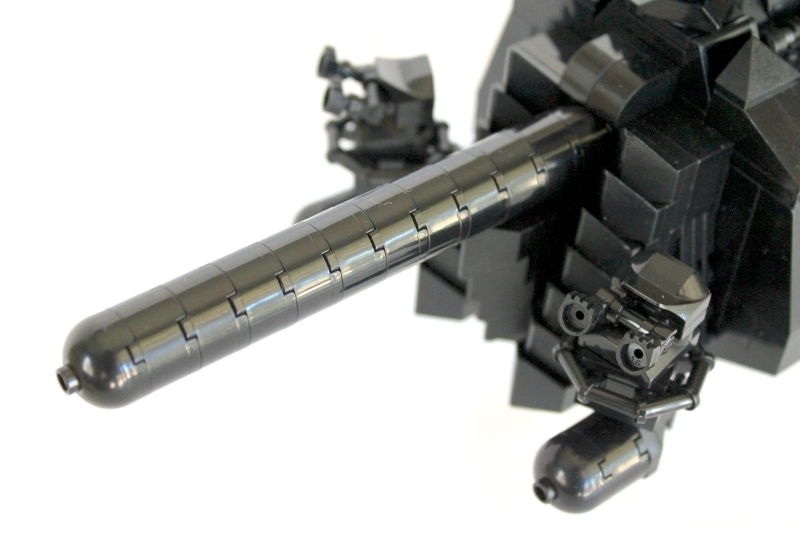 The various cannons design are all excellent. I really love the textures with the slopes too. The overall proportions are original. Very convincing, nice ship !!! What? 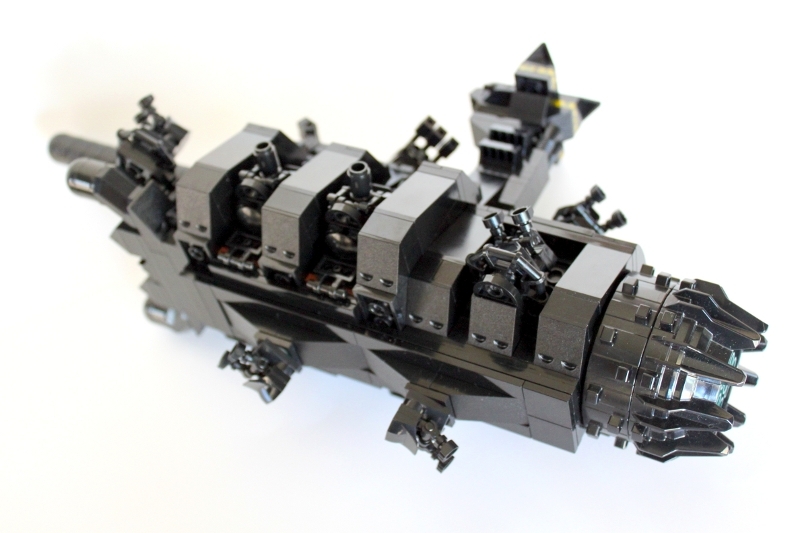 They said you were going to make a black micro scale ship. Are the color parts just to stick your finger in their eye? (where they was probably some amalgam of Hans and Bones). The weapons are very well done for its size. Very nice ship man. I love this design, all the cannons and the placements remind me a pirate ships. Love the detail and the ship. Good job! I like the colour scheme, I guess that goes for lots of your MOCs! 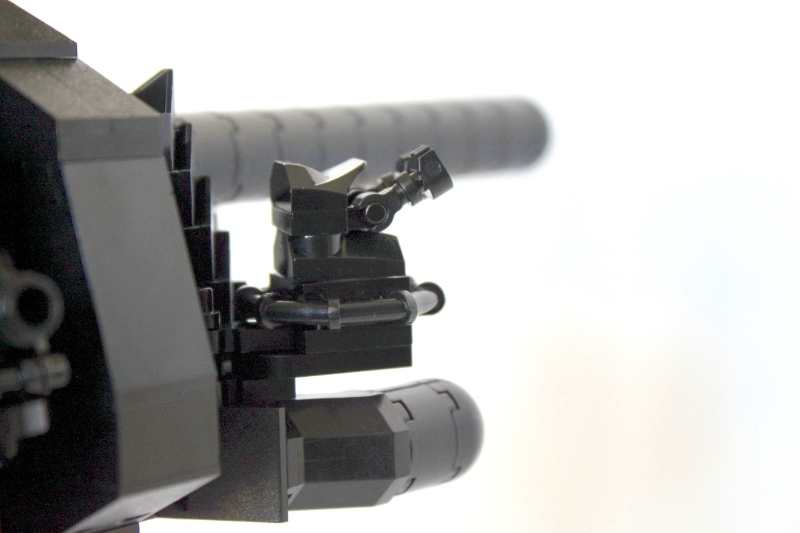 The guns turned out very well, my favourites are the ION Cannons! Oh man, that thing is the SIHT! 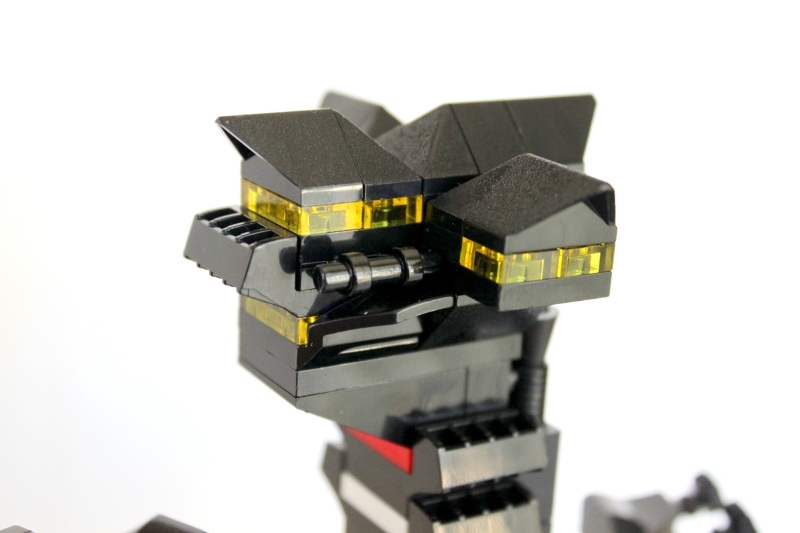 Great microscale work Shifu, funny as Hades write up as well. Amazing ship! I like those one color MOCs, well almost one color, lovely detailing and great overall shape, well done my friend. So many cannons! Great ship, just don't pick a fight with it..
Nowthis is a force to be reckoned with. The ship looks great and the weapon systems are awesome. I'd hate to be on the recieving end of the B.E.E.F. injector cannon lol. Nice micro-scale weapons! Very good! "Where's the beef?" Oh, wait. There it is. It's the great big thing. Way out on the front, kinda hard to miss. Anyway, rambling aside, very nice ship, weapons are good, bridge looks kinda high up for my tastes, but other than that, great look to it. Black Mocs always look good. This ship looks beautiful and threatening at the same time. The level of detail is amazing. 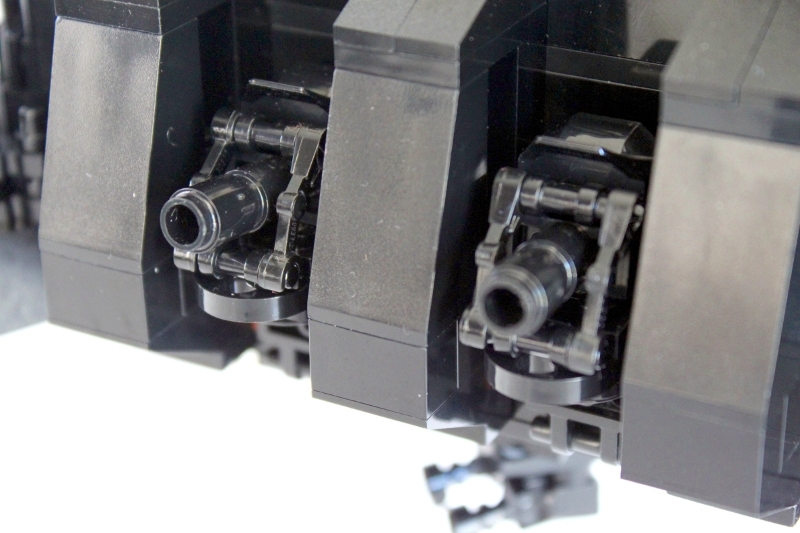 My favourite parts are the heavy ion cannons and the ion pulse cannons. The only part that irritates me a bit is the bridge. No engineer would design a battleship with a bridge that obvious, unprotected and easy to destroy. But hey, it's scifi and the whole ship is fantastic! That ship is a real thing of beauty! Awesome array of armaments, Dude! Love the variety in the weaponry. Excellent! This is brilliant! you have brilliant uses for plain pieces! 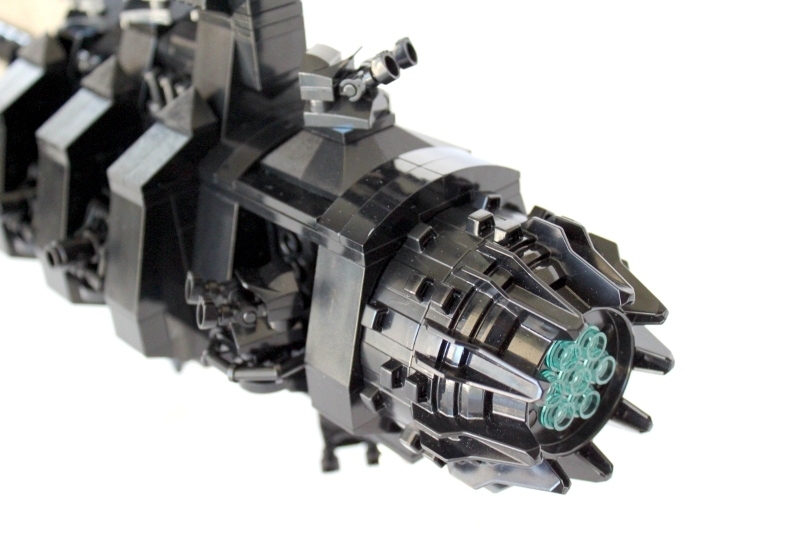 those Heavy Ion Cannons are amazing! thumbs way up! love all the detail! Black on black; you're better than Johnny Cash. <3 The bridge. I think the skeleton legs work a lot better when they're upside down... for some strange reason. 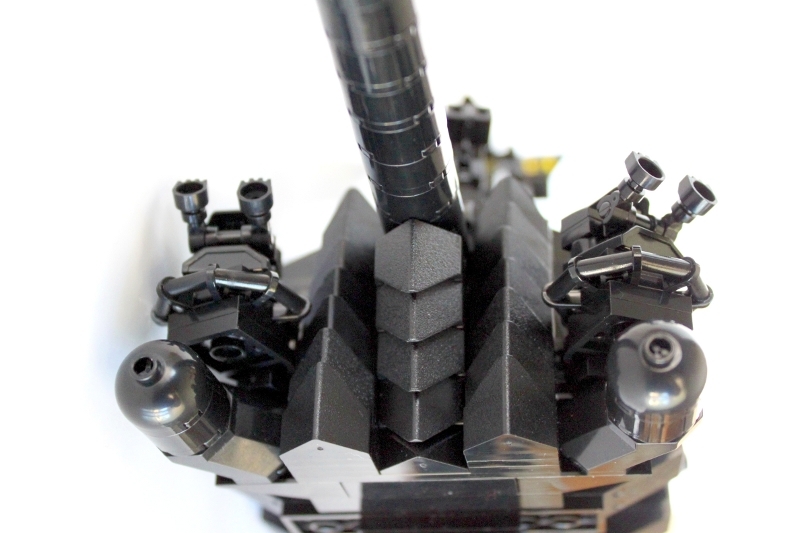 The design is very cool, the gun ports and turrets are stunning, and the technobabble is acceptably convincing. Very nice page! Very sleek and stylish! Nice build! 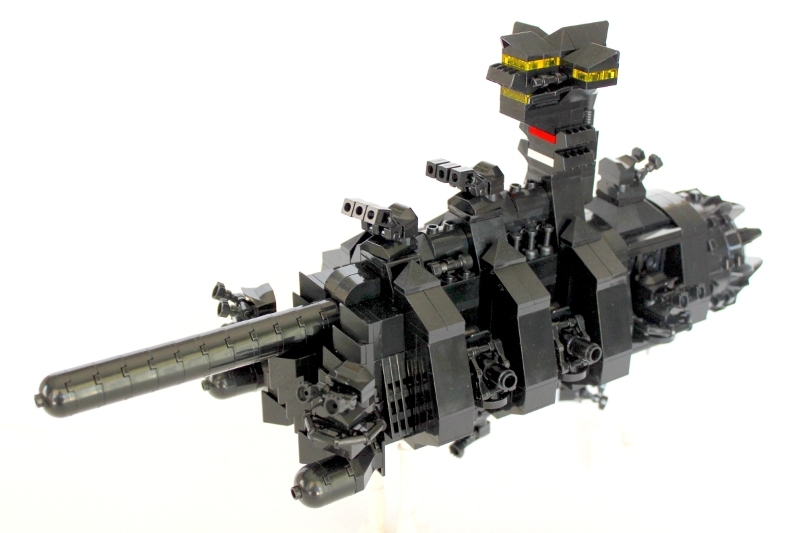 Excellent build, the weaponry and the bridge are my favorite parts. Oh, that came out wrong. So Gothic, love the bridge, and those sweet side cannons.